The Scandinavian Redwood Pine 4 Foot Log Store is one of the more classy and elegant looking log stores on the market right now. 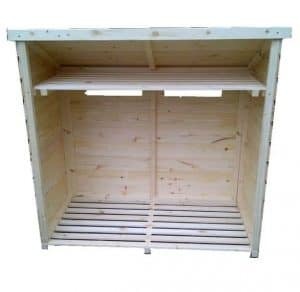 It has a very smooth and smart look and as the log store is pretty much fully boarded, it offers a level of privacy that most other log stores do not give. Still, even with the fully boarded sides, the slatted floor and the two open panels on the back will ensure that the logs you have in here stay as free from moisture as possible. 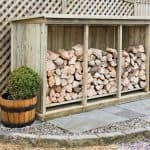 The amount of space this offers is just ideal, as it will allow you to store plenty of logs, but it is not so large that it will take over the whole garden. One really smart feature of this log store is that it has an extra storage shelf near the roof. This is perfect for keeping things like kindling and anything else you may need safe and close to the fire logs. Made with Scandinavian Redwood, this is a log store that is very robust. The cladding on the sides and back is very strong and the roof is made with this same kind of wood. The floor is very strong thanks to the thick boarding they have used. It is all tied together with an impressive frame that will make sure that even when you throw a log in here, the log store can take it. The Scandinavian Redwood Pine 4 Foot Log Store is a log store that really caught our eye right away. It has such a smooth and high quality look to it that if it had a set of doors on it, we would swear that it was a high end bike store. This really is one of the better looking log stores that we have come across. The width is 3 feet 9 inches and the depth is right on 2 feet so while not huge, you still have enough room to have a good stockpile of fire logs. The log store stands at 4 feet high at the front. One thing we have to mention is that just near the top of the log store is a shelf. This is a very interesting design choice and one we cannot recall seeing anywhere else. This is a great little addon that will also give you a little bit of extra storage where you can keep your kindling, a shovel or a pair of gloves for picking up the logs. We really like the pent roof that they have gone for on this log store. It is very steep so rain is always going to run off the back. The roof is made with the same kind of wood as the rest of the log store so it is strong and looks great. The top of the roof is covered with felt to help give it some extra protection from the elements. Ok so we will be honest here and let you know that they are a little shy in giving some real details about the Scandinavian Redwood Pine 4 Foot Log Store. But do not worry as we have used our detective skills and can tell you what kind of log store this is. The cladding they have used has a real thick look to it and is tongue and groove. Interestingly it is pretty much fully boarded at the sides and round the back, so it will offer your logs plenty of protection from the elements. Also, as it is nice and thick, it is able to take a bit of abuse such as when you throw logs inside. Like the cladding, no specific details are given about the frame. But from what we can see this looks to be a 28 mm x 28 mm standard frame, which is exactly what we would expect. This is a good frame, which, along with the cladding will make this one very strong log store. As you can see from the pictures, the frame while thick and strong will not take up too much of your space in the log store. We really like what they have done with the floor. First of all it is raised a good few inches off the ground to ensure that the logs are kept as free from moisture as possible. The flooring is made with some thick boards and we have no worries about the floor being able to take the weight of lots of logs. The Scandinavian Redwood Pine 4 Foot Log Store is made with wood that is weather resistant, but they do not actually come out and say that the wood is pressure treated. Of course you can always ask them directly, but if you ask us, you would be better off giving this a real good coating of wood treatment once you have installed it. Logs can be wet and as this is open it will take a real beating from the elements, so an annual coating of wood treatment each summer would really help ensure you get years of use out of this. 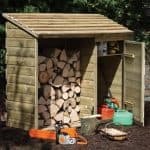 You can probably expect to get at least a ten year anti rot guarantee with this log store, but we would still recommend that you check. Also, make sure to see if the warranty is dependent on you treating the wood as this is something many sheds, log stores, workshops and so on require you to do in order for the warranty to be valid. Like other log stores, the whole front of this is wide open. We really like this and as this is a wide open space, not counting the little shelf of course. You are not going to have any trouble at all reaching your logs or anything else you put in here for that matter. On the back of the log store are two small open areas. These are not there to be windows so people can see inside, but they are there to let in some air around the logs to help fight off moisture. We think this was a very smart design choice and one of the features we really like about this log store. Security is not really something log stores give you and this one is the same. Do not worry though, we do not think you will have any worries with any kind of crazed firewood thieves! This is actually one of the more private log stores that we have seen. We say this because of the fully boarded sides. So if you positing this the right way then it could make it so no one could see how many logs you have like they could if the sides were slatted. Actually we would go as far to say that from the sides and to an extent even the back this looks just like a general storage shed. 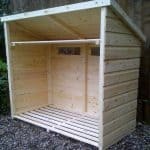 There are no customisation options on offer at all with the Scandinavian Redwood Pine 4 Foot Log Store. If you do want to change the look a little bit, then have a think about using a wood treatment that is coloured. While we like the natural wood look, you could go for a wood treatment that is red, blue or green to give the log store a bit more personality. Interestingly, there is not one single extra on offer with this log store, but we are actually going to look at that as a positive. You see, the more money in your pocket means you have more money to spend on fire logs and kindling to fill this awesome log store up with! This is a fantastic log store and while just by looking we can tell what kind of materials they have used, we must say had they said exactly how thick the cladding and frame are we probably would have scored this another half point. This is clearly built to last. The thick walls and solid frame really will make sure you get plenty of years out of this log store. We would still recommend you give it a coating of wood treatment once a year to really make sure it stays looking smooth and smart. 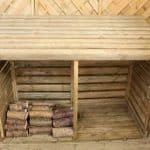 This is not one of the bigger log stores on the market, but we feel it offers more than enough space for most people. Plus that extra storage shelf they have included was a very nice touch and something we really like. We do not see anyone having any trouble installing this. With a friend it will be very easy, but even to do on your own, as it is only 4 feet high, we do not think you will have any problems. Like we said about the quality, we would have probably scored this a little higher if they said for sure what the materials were. Still, this is one of the more high end log stores and that is why the price is a little higher than other similar sized log stores. Final Thoughts: We have to say that the look of the Scandinavian Redwood Pine 4 Foot Log Store really is awesome and it certainly will be a great stand out feature in any garden. It is also very practical and we love the fully boarded sides and think the way the floor is slatted and the two open panels on the back is a very smart design. 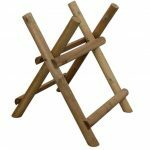 It offers security and also ensures that there is a good airflow around your logs. We know that the price is a little high, but this as we have said in the review, this is a high end log store. 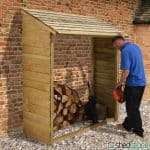 We know some people are fine with just a basic log store and do not care what it looks like, but if you want a log store that is also going to look good in your garden, then this is one you have to consider.